One thing we’ve found to be almost invariably true is that people who love the outdoors also love food. Food is, after all, one of life’s pleasures, and is rarely appreciated more than when you can dig into a hot and satisfying meal around a campfire, after a hard day of hiking. 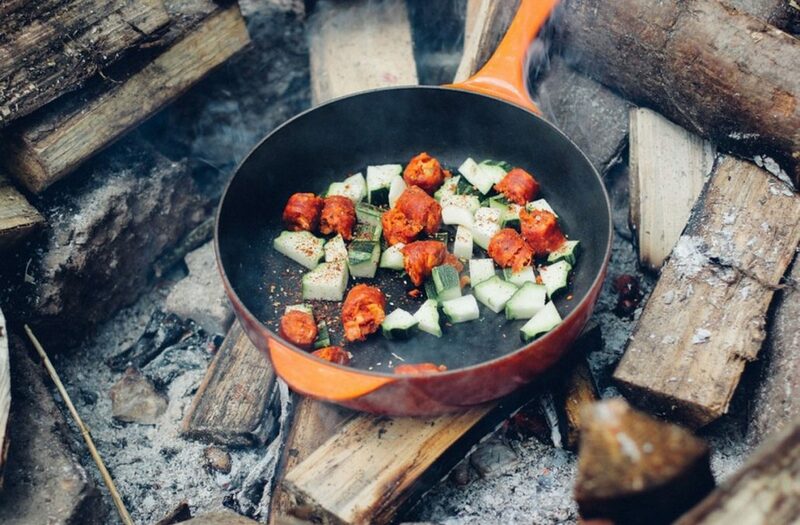 But when it comes to backcountry cooking, effort is required to ensure that your meal is not only delicious but also provides you with the energy and nutrients you need to keep going. The most important factors to consider is calories- you’re going to need a lot of them. The average adult burns about 2,000 calories a day, but just one hour of hiking can burn somewhere between 500-700 calories, so a full day of hiking can easily triple your body’s calorie needs. These numbers can also vary based on your metabolism, physical fitness, difficulty of hiking, and even the temperature outside, so while these guidelines are helpful, we highly recommend erring on the side of caution and bringing a bit more food than you will need, especially if you’re new to hiking and are not used to your body’s particular calorie needs. Calories come from three sources: Fats (9 cal/g), Proteins (4 cal/g), and Carbohydrates (4 cal/g). Since fats are the most calorically dense, including a high percentage of fats will make it easier to meet your calorie needs, however, balance is key. To feel your best and hike most efficiently, you need a healthy combination of all three groups. Breakfast- There’s a reason oatmeal is a favorite meal for hikers. It’s lightweight, easy to carry, and chock full of fiber from whole grains. We like to pack pre-measured baggies with 1 cup of oatmeal and 1 tbsp chia seeds, for an extra boost of fat. You can also throw in some dried fruit, nuts, and a protein shake pouch to add some extra nutrients and protein. If you crave a more traditional breakfast, a number of brands make dehydrated or freeze-dried breakfast scrambles. Lunch- Most hikers prefer to eat lunch on the go, rather than stopping and cooking. That makes portable no-cook food a priority. We like to be prepared with a variety of dried fruit, nuts, and energy bars (try Threshold Provisions’ bars, or if you’re feeling ambitious, whip up a batch of Phil’s No-Bake Bars -see below- before you hit the trail). Wraps are also a great option, as tortillas are easy to transport and can be filled with a variety of trail stable foods. Depending on how long you’ll be on the trail, hard cheeses and meats that don’t require refrigeration (think summer sausage and some salamis) make excellent savory options. We also love peanut butter & banana, tuna (bring the pouch variety to save weight), or hummus (Fantastic Foods dehydrated hummus mix is available at most health food stores). Dinner- After you make camp, you can afford the luxury of a hot meal. This can be a prepackaged or homemade dehydrated meal. We love the gourmet offerings from Good-To-Go like Thai Curry and Wild Mushroom Risotto. Shelf stable foods like ramen and boxed macaroni & cheese also make great budget-friendly options, just make sure to bring some protein and dehydrated veggies to amp up the nutrition value. Extras- Having a few little luxuries can make all the difference. Coffee/Tea- European grocery stores often carry high-quality instant coffees. If you want to go the from-scratch route, pick up a backpacking pour over filter. Hydration Tabs- Keeping your electrolytes up will help stave off dehydration and keep you performing at your best. Spices- these can improve even the most mediocre meal. Staff favs include za’atar, minced onion, and crushed red pepper. Peanut Butter or Coconut Oil- Great sources of extra calories and general yumminess. Bonus: coconut oil also makes a great moisturizer and provides sunburn relief. Chia Seeds- A great source of healthy fats and extra calories, these can be added to just about anything. Calorically dense water, anyone? In a saucepan combine coconut oil, honey, and peanut butter over low to low- medium heat. Stir until homogenized and pour over dry ingredients. Mix until dry ingredients are completely coated. Transfer mixture into a prepared 9×9 pan and press until evenly thick from edge to edge. Put in the refrigerator for at least 2 hours to allow to set. Using a dehydrator, dehydrate onions (6-12 hours) and kale (2-3hrs) at approximately 125 degrees. Once dehydrated and cooled, pack vegetables in a small ziplock bag. Repackage noodles in a separate ziplock bag. All other ingredients can remain in their original packaging. Bring a pot of water to a boil, then add noodles and vegetables, boil until noodles are al dente, then strain using a strainer lid or carefully pour the liquid off while using a spork to hold back noodles and veggies. Mix in cheese packet and tuna and cook until warmed through.